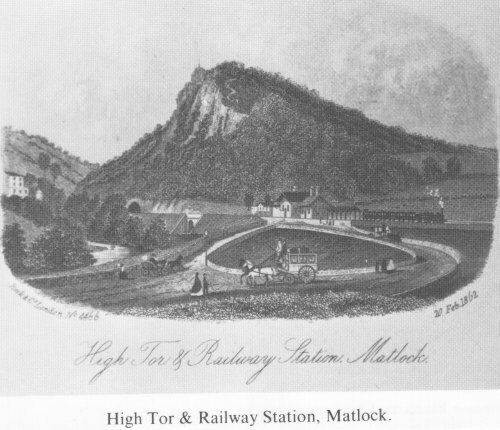 High Tor and station, Matlock 1862. High Tor tunnel, Matlock 1869. Enlargement of a better tinted version of "posted 1909". 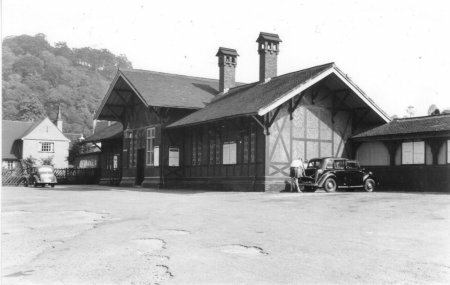 The station was built in Swiss chalet style (Matlock Bath was called "The Switzerland of England!). This view gives the impression the only access to the station was by ferry! 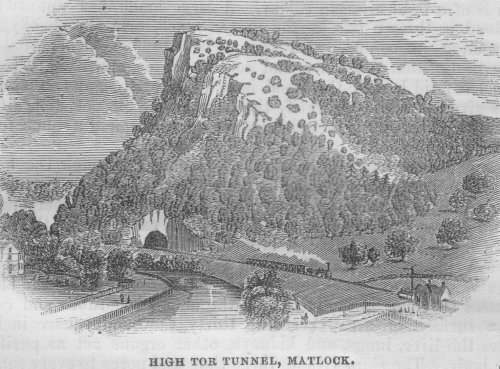 The newly built railway and tunnel between Matlock and Matlock Bath. This engraving was made on 20 Feb 1862. The 1869 engraving is from John Smedley's book "Practical Hydropathy", see more on X357. 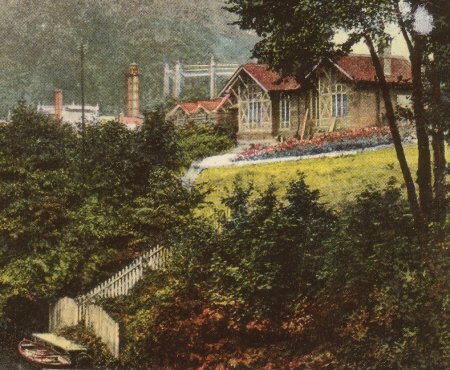 The Gas Works were right next to the station, as gas was distilled from coal and coal came by rail. The unsightly gasometer was built in 1854, but is not shown on the two engravings. The horse-drawn omnibus is shown. Gas Works, at the north end of the Bath, were erected in 1854, at a cost of £2,000, by a company of £5 shareholders, since which, the capital has been increased by the addition of new shares to the amount of £1,000. The works consist of a gasometer capable of holding 10,000 cubic feet of gas. There are five retorts. The average annual consumption is about 1,000,000 cubic feet, which is distributed at 7s. 6d. per 1,000 feet. The Matlock branch of the Midland Railway runs within a short distance of the Bath, where there is a Station, from whence there are trains between Ambergate and Rowsley five times each way daily, except Sundays, when there is but one each way. An omnibus and cabs attend the arrival and departure of every train. Mr. Robt. Skirrow, station master.